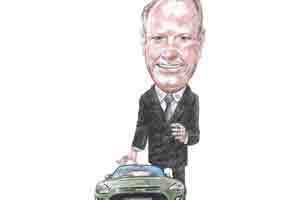 Fordable: Ford is finally part of the rising middle-class economic ambition. Michael Boneham, president and managing director of Ford India, has no time to waste. He is spending his 54th birthday giving interviews and visiting showrooms to take stock of how they are coping with the accelerated sales of Ford’s first “small car", the Figo. We meet in an insipid beige and grey office in a Ford showroom, and Boneham fits in lunch (a McDonald’s burger and fries) during the session. The showroom is in Kirti Nagar, an industrial area in west Delhi that looks like a strip mall of car showrooms. It’s a place symbolic of urban India’s rush to acquire a car, fuelled by increasing economic affluence, and the reason why Boneham is in perpetual haste. According to industry estimates, 3.2-3.4 million Indians will buy cars this year, and that number is expected to grow to five million by 2015, and nine million by 2020. For 15 years, Ford struggled to make inroads into this bristling market. Between 1996 and 2010, Ford launched six passenger vehicles, four of which were discontinued after poor sales. The US car manufacturer was desperate to get it right, produce that one car that would stick. To do that, Ford had to step outside its comfort zone and make an affordable small car, the segment where more than 70% of all car sales happen in India. Enter the Figo, a hatchback that costs almost half that of Ford’s next most affordable car in India, and compares favourably with Maruti’s compact cars, considered the most modestly priced in the country. “We needed the Figo to take us to a different dimension and I believe we have delivered on that," Boneham says. “What the Figo has done for us is (it has) brought Ford into the mindsets of first-time car buyers. So far, over 50% of Figo buyers are first-time car buyers, and that is an amazing thing." What it means is that Ford is finally part of the rising middle-class economic ambition—you come in a two-wheeler, and leave in a car. In 2009, Ford sold just 29,488 cars across all segments. But six months after the launch of the Figo in March 2010, Ford had sold more than 50,000 units of just the hatchback, and the firm’s overall sales for the year nearly tripled. To achieve this phenomenal jump, Ford had to restructure all its major operational procedures—from design, engineering and manufacturing, to sales and servicing. This year, from January-September, it has sold 90,612 cars across all segments. Flush with the success of the small car, Ford has announced that it will launch eight new vehicles in India by 2015. “I don’t think I’ve been involved in so many important decisions in such a short span of time in my 27 years with Ford," Boneham says. That coming from a man who supervised the manufacture of the third generation of the iconic Range Rover when Ford took over Land Rover from BMW in 2000, and was the plant manager for the Michigan, US, factory that rolled out the latest generation of Mustangs, the legendary stock racing vehicle. Boneham though is neither an engineer, nor an MBA. He taught in a primary school in Australia for five years before losing the motivation to teach, and setting off on a backpacking trip to Europe in 1984. When he returned to Australia, he responded, on a whim, to a newspaper ad by Ford, which was looking to fill a human resources position. “I was really surprised when I got the job," Boneham says. “I was an education and training officer in a plant in Sydney, looking at the workers’ learning challenges. I knew nothing about body shops, power trains or how cars worked." But he picked up that knowledge on the job, and within a year, he had moved to vehicle operations. Soon, he was being transferred around Australia to various Ford plants, and then to England, US and Thailand. Through this serial globetrotting, his wife, whom Boneham met when he was 20 and she 19, kept the family grounded. “We have three sons and the family moved with me every time we changed countries," says Boneham. “It was always more of a challenge for her and our children than it was for me because I would just go to work to a Ford plant, which followed a common language and common processes around the world. But my family had to adjust to a new school and education system, a new social structure, adapt to the different lifestyle." Inevitably, there were issues with cultural identity. 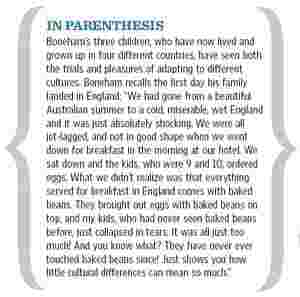 Boneham says he learnt, watching his children, that “being different" was the last thing they wanted. It was much easier to blend in, to assimilate. In the US, his children came home one day and declared they were going to change their accents to an American accent “as of tomorrow". “They weren’t becoming more global, just more American, or more British," Boneham says. “They had little idea about Australian history. I wanted them to understand what being an Australian was all about, but obviously, it was wonderful to have the family together." His eldest son put an end to the dilemma in 2005 when the family was preparing to move to Thailand from the US. Just 13 then, he came up to Boneham and told him he did not want to move around any more. “He told me he needed to go back to the place where he belonged," recalls Boneham. “It was tremendously mature." Eventually, all three children went back to Australia to boarding schools, with Boneham’s wife taking on the complicated task of dividing her time between the children in Australia and her husband in Thailand, and later, India. Every chance they get, Boneham and his family spend time together. Most recently, they holidayed in Kashmir, but more often than not, the reunions happen in a family house on the beach, just 2 hours from Sydney. “Sun, sea, surf and family—it’s the place I think about and miss the most," Boneham says.